Click here for a fully formatted pdf file of the March newsletteer. The Winter Olympics have just finished. I usually do not enjoy the Winter Olympics as much as the Summer Olympics because I have a hard timed imagining myself on skates or skis. Ice scares me. I do, however, love competition. Meggie (our awesome Youth Director) regularly humiliates me in ping-pong. I find myself sweating and diving for balls in an attempt to beat her. Just this week I finally won! VICTORY! I danced around the room in celebration of my win. I then apologized for my poor sportsmanship. With Easter approaching I have noticed that terrible displays of poor sportsmanship are not limited to ping-pong. It seems that everywhere I look people have turned life into a competition. Politics seems to be more about scoring points that finding sensible solutions. Disagreements, even amongst friends, seem to be more about trying to prove who is right than about relationship. The season of Lent, which prepares us for Easter, is the perfect time to think about how we live. Jesus was not about scoring points. He told the truth and did it in loving relationship even with those who sought to stop Him. He knew that God’s plan was already in motion. Our faith as Christians is not about winning or being right. The victory has already been achieved for us. Instead, it should be about growing in our likeness to Christ. This only happens by God’s grace and that means we must be seeking a deeper relationship with God through prayer, service, worship, and the sacraments. Perhaps the question we should be asking is this: Are we setting a new personal best in love? Living like the victory has already been won means conforming ourselves to the path of discipleship. We need to share God’s message instead of attacking those who do not yet believe. We need to serve others, not so that people will see how “good” we are, but so that they may see that God’s Kingdom is truly coming. Lastly we need to stop worrying about being right and instead worry about being Holy. Easter this year can be a reminder to us that nothing can stop God’s love. Suffering and even death itself are overcome in the resurrection, and there is no beating that! So I ask you to join me in committing ourselves to following Jesus and setting a new personal best by God’s grace alone. 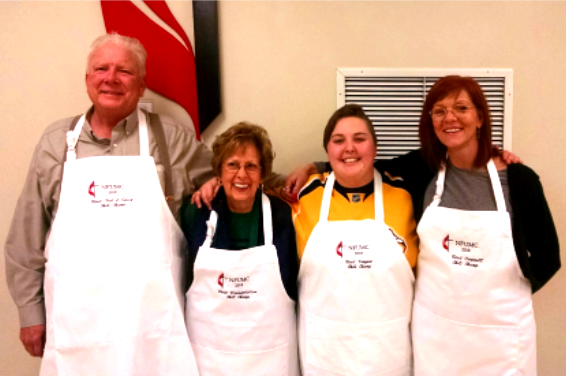 On February 3, the United Methodist Men (UMM) hosted the annual Chili Cook-off. Thank you to all that brought chili and attended the event. The winners were Karen Hoffmeister for best decorated table, Meggie McDowell for best vegetarian chili, Kim Jones for best all around chili, and Richard Howard for the hottest chili. Congratulations to all the winners!! The Nolensville Historical Society’s Buttercup Festival will be Saturday, April 14, 10am-5pm. The UMM will have a booth set up selling food and free bouncies for the kids. If anyone is interested in helping out during the day, please contact Wayne Dickey at wayne.lisad@comcast.net or 615-533-4522. Please join us on March 11 at 9:30am for Second Sunday Breakfast. Bring a favorite breakfast dish to share and come fellowship between the services with church family from the other service! The Journey Sunday School Class is responsible for set-up, drinks, and clean up on March 11. Please remember that the class responsible for Second Sunday Breakfast is also requested to provide cookies, donuts, or other snacks for all other Sundays of the month. The UMW met on February 14 with fifteen members present. On February 3, several of our members attended a Local Officer Training and Faith Lift program at Mt. Pleasant First UMC. Marcia Woodcock give us an overview of the Faith Lift program and found Rev. Allen Black’s (our Harpeth River District Superintendent) message outstanding. Barbara Belden is organizing UMW work days at GraceWorks Ministries. In March, we will be collecting cereal and fuel bag items for GraceWorks. Penny Belden reminded us that prayer shawls are for anyone to take and give to someone that is in need of prayer. Please write the name of the shawl and the recipient in the cabinet so that we can keep track of them. The Prayer Shawl Ministry meets third Thursdays of the month at 1pm in the Fellowship Hall. If you do not know how to knit or crochet, we would be happy to teach you. Or, just come and do any craft and fellowship with us. Several of the UMW ladies helped our youth make fleece blankets for Ronald McDonald house. The both groups were excited about making them and truly enjoyed doing the project. A delightful time was had by all. The UMW will provide individual portioned sweets for the UMM food booth at the Buttercup Festival. Anyone that can bake is welcome to contribute. Barbara Belden and Tressa Tuck presented a program on “Rest.” We made Valentine heart treats out of candy kisses, toothpicks and paper heart cutouts. Some of the kisses may have been eaten before the project was completed. The meeting was adjourned with prayer, and several ladies had lunch at the Tokyo Japanese Steak House in Smyrna. Our next meeting will be Wednesday, March 14, at 10:30am in the Fellowship Hall with Farron Light as our hostess. Hey guys! It's that time gain! Time to roll up your sleeve and do a great deed! Remember walk-ins are welcome, but we would also love to fill these appointment slots, if we can! Please sign up and tell a friend! Thank you so much for your past donations! We appreciate you so much! The need for blood is constant and only volunteer donors can fulfil that need for patients in our community. Nationwide, someone needs a unit of blood every two to three seconds, and most of us will need blood in our lifetime. Nolensville First UMC will host a Red Cross blood drive on Thursday, March 8, 1:15-7:15pm in the Fellowship Hall. Please join our lifesaving mission and schedule an appointment at www.RedCrossBlood.org today! Streamline your donation experience and save up to fifteen minutes by visiting RedCrossBlood.org/RapidPass to complete your pre-donation reading and health history questions on the day of your appointment. Download the Red Cross Blood Donor App on the App Store, Google Play or text BLOODAPP to 90999. Schedule appointments, get rewards and invite friends to join you on a lifesaving team. Our United Methodist Women are serving through giving to GraceWorks Ministries. Every month they are concentrating on a particular need of GraceWorks, and would like to encourage the entire congregation to help. In March, they are collecting boxed cereal, and every month they are collecting items for the Fuel Bag program: peanut butter crackers, fruit snacks, cereal bars, granola bars, fruit cups, and pudding cups. Items can be left in the GraceWorks bin in the breezeway. Thank you! In February, our Benevolence Fund donated a total of $1,650 to the Nolensville Food Pantry, End Slavery Tennessee, and to help send one of our members to work at a soup kitchen in New York City for a week. Thank you for your generous gifts you leave at the altar rail during Holy Communion that fund this ministry. Cyclone Dineo roared through Mozambique in early 2017 and left destruction in its wake. Seven people died, more than 50 were injured and thousands were displaced. One of the world’s poorest countries, Mozambique is especially vulnerable after catastrophic weather events. The day after the storm, the United Methodist Committee on Relief (UMCOR) issues a $10,000 emergency grant to The United Methodist Church in Mozambique for food distribution in the Inhambane area, and then followed up with a grant for $250,000 to support the rebuilding of at least 40 homes in the affected communities. UMCOR’s ability to provide grants is due to the designated giving of United Methodists around the world. However, when you give to the UMCOR Sunday special offering, on March 11, you support the operating activities of our world wide relief agency, enabling it to assist churches and communities in times of disaster. The offering ensures that 100% of every designated gift made through UMCOR for disaster response and other critical needs goes directly to address those needs. The work in Mozambique is a fine example of how UMCOR gives more than money. Indeed, your gift on UMCOR Sunday allows UMCOR to give hope. We will have a bake sale on Sunday morning, March 18, to fund scholarships for Cedar Crest Camp. If you can donate yummy goodies, please contact Christina Clark at children@nolensvilleumc.org by March 11. Children of all ages are welcome to contribute. SUMMER MISSION TRIPS: DON'T FORGET to register for Summer Mission Trips! Registration form and a $25 deposit are due Sunday, March 11! High Schoolers are going to Memphis June 3-8. Middle Schoolers are going to Birmingham June 17-22. Please donate individually wrapped candy or prizes for the children’s egg hunt. You can leave the donations on Christina’s desk by March 21. Thank you for supporting NFUMC Kids! On Friday, March 23, at 6 pm, 4th and 5th graders are invited to the Martins’ house for an exciting egg hunt and potluck dinner. Dress for outdoor play with close-toed shoes. Bring a flashlight and a favorite dessert or side to share; main dish and drinks will be provided. Parents are welcome too! RSVP to Christina at children@nolensvilleumc.org by March 18. Join us on Saturday, March 31, at 6 pm for a potluck and egg hunt. Please bring a covered dish to share (the church will provide drinks) and Easter egg baskets for those with children up to 3rd grade. All ages are welcome to attend the potluck for fellowship before the Resurrection Celebration. Maundy Thursday occurs during Holy Week to commemorate the last supper Jesus shared with His disciples. When Jesus washed the disciples’ feet, He displayd what it means to be a servant. In response to Jesus’ actions, we are called to love one another in the simple ways He showed. We will worship with songs that stir us to answer the call to serve, share communion at the Lord’s table and recall Jesus’ example of humility. Our Saturday night Resurrection Celebration is an additional Easter worship service. This opportunity to joyously celebrate Easter will feature our NFUMC Praise Band. Our hope is to inspire you to worship in a new and active way! Worshipping on Saturday night, at an hour and place different than we normally do, offers a sense that something unexpected has happened. Where there appeared to be no hope, there is now hope. Where there was death, there is now resurrection! In 2017, the Council agreed to contact dormant members. Please contact the Pastor if you are able to serve here. The Council agreed to help fund a mission trip for one of our college students. Pastor Jimmy is looking for a team of laity to help him take Communion to our home-bound members about once a month. There will be training. Please contact him if you would like to serve. Pastor is working with laity to present a basics-of-Christianity course for those outside our walls. Don Hoffmeister presented the 2017 end-of-year numbers: although we were about $6000 shy of income compared to our expenses, a bequest was made to the church that covers that shortfall. 2018 looks good so far. Look in the weekly bulletin for weekly updates. The council agreed to let Chris and the staff adapt a graphic to go with our new mission and vision that more accurately reflects Nolensville First UMC. 3/1 Gail & Tom Howell (51); 3/6 Diane & Joe Wisniewski (36); 3/12 Susan & Tom Baker (24); 3/24 Farron & Charles Light (54) and a very special congratulations to Kim & Eric Woodward who will celebrate their 25th wedding anniversary on March 20!